If you are sure that you've identified the episode you can continue right away but if in doubt then please wait for confirmation before doing anything. Could an award be given to this person? It could be Prophet Motive. 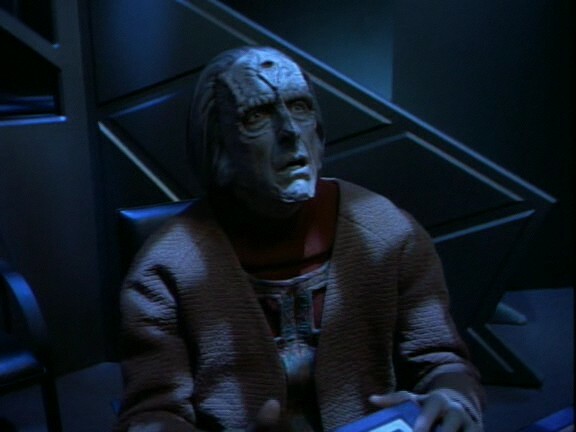 Bashir was nominated for the Carrington Award. He didn't win it, though. Ding, ding, ding! Good job. "THE DOGS OF WAR"... the only one where both appear in the same episode. Yep. You may go on. Ding, ding, ding! You got it. "Winning isn't everything." Name the episode. I really don't know, but it sounds like something with Baseball involved. Take me out to the Holosuit? No, but that line would have worked well in that episode. Clue: "Have you ever won a case?" Armus and kkt like this. You are the winner! I loved Fritz Weaver as the Cardassian Attorney. "You flatter me sir!"